This article is about the 2006 horror film. For the 1996 comedy film, see Black Sheep (1996 film). 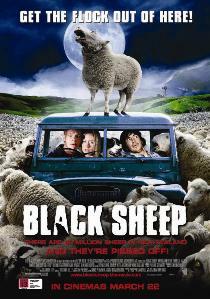 Black Sheep is a 2006 New Zealand black comedy/horror film written and directed by Jonathan King. It was produced by Philippa Campbell and stars Nathan Meister, Peter Feeney, Danielle Mason, Tammy Davis, Oliver Driver, Tandi Wright, Glenis Levestam, Nick Blake, Matthew Chamberlain, Nick Fenton, Eli Kent, and Sam Clarke. The special effects were done by Weta Workshop. The film premiered at the TIFF on 10 September 2006 as part of their Midnight Madness series. It was theatrically released in New Zealand on 29 March 2007 by The Weinstein Company. Black Sheep received positive reviews from critics and grossed $4.9 million at the box office. It also received a Narcisse Award nomination for Best Feature Film. A young Henry Oldfield (Nick Fenton) lives on a sheep farm in New Zealand, with his father and older brother, Angus. After witnessing his father's pride on Henry's natural ability at farming, Angus plays a cruel prank on him involving the bloody corpse of his pet sheep, just moments before Mrs. Mac, the farm's housekeeper, comes to tell the boys that their father has been killed in an accident. The combined shock of these two incidents leads Henry to develop a crippling phobia of sheep. Fifteen years later, Henry (Nathan Meister) returns home to sell his share of the family farm to Angus (Peter Feeney). Unknown to Henry, Angus is carrying out secret genetic experiments that transform sheep from docile vegetarians into ferocious carnivores whose bite can transform a human into a bloodthirsty demonic half-sheep monstrosity. While trying to expose Angus's experiments, a pair of environmental activists named Grant (Oliver Driver) and Experience (Danielle Mason) accidentally release a mutant lamb. As Grant and Experience flee from the scientists, the lamb bites Grant and infects him. The lamb then escapes into the fields and infects the flocks of sheep. Meanwhile, Henry and an old friend, Tucker (Tammy Davis), decide to take a drive on the farm. Tucker sees a sheep that refuses to run away. At the same time, Experience steals a rifle from the car to try to shoot them. They eventually team up with each other to investigate a farm house that has smoke pouring out of it. Inside they find the mutilated body of a farmer. Henry sees a sheep in the hallway and, because of his phobia, he quietly shuts the door and locks it. The sheep tries to crash through the door. Tucker shoots the sheep. On the other end of the farm, Angus is driving around when he sees Grant. Grant bites Angus and runs off. Back in the car, Tucker, Experience, and Henry leave to warn Angus about the killer sheep, but a sheep hiding in the car bites Tucker. After the car is destroyed, they seek refuge in the laboratory. Henry and Tucker finally realise that Angus is conducting cruel experiments. When one of the scientists see that Tucker's foot has now become a sheep's foot, she keeps him there for study but Experience and Henry escape when Angus cannot bring himself to shoot his own brother. Suddenly, hordes of sheep come running down the hill. They see an offal pit surrounded by a gate. Henry accidentally slips into the pit, and his brother refuses to help. Henry and Experience fall into the pit but escape in the underground tunnels. Meanwhile, Tucker transforms into a sheep, but the scientist administers an injection of amniotic fluid from one of the mutant lambs which transforms him back to human. But when she goes to give the shot to Angus, she gets eaten by the sheep. Angus gives a presentation to businessmen about his new genetically engineered sheep. The businessmen are soon slaughtered by the infected sheep. When Henry and Experience try to warn Angus, they discover he has a love for sheep. Disgusted, they leave. Henry realises he has been infected so, like Angus, sheep no longer attack him. Henry and Experience go their separate ways. Henry ends up fighting with his brother, who has now transformed into a gargantuan sheep monster: however, only as intelligent as a sheep, Angus is kept in check by Henry and the farm's sheepdog. While he is cornered by the dog, the revolving propeller of the family plane cuts into Angus and wounds him badly. Tucker suddenly arrives and disinfects Angus and Henry with more amniotic fluid, administered via a medicine nozzle designed for sheep. Experience arrives. Even though Angus is now a human, he goes back to the sheep and tells them to bite him again. The sheep, driven mad by the smell of blood, devour Angus. Eventually, all the sheep are contained and killed in a giant bonfire of ignited sheep flatulence. The cure is given to the surviving were-sheep people, including Grant. However, the sheepdog now makes sheep noises. Special effects for the film were handled by Weta Workshop, including participation from Richard Taylor. The film was financed in part by an investment from the Korean company Daesung Group. This was the first time a Korean company had directly invested in a New Zealand film (though Weta Workshop had previously collaborated with Korean effects houses on the South Korean film The Host). Black Sheep premiered at the 31st Toronto Film Festival on 10 September 2006 as part of their Midnight Madness series and was released in New Zealand on 29 March 2007. Black Sheep was released on DVD and Blu-ray on 9 October 2007 by Icon Home Entertainment. Rotten Tomatoes, a review aggregator, reports that 71% of 94 surveyed critics gave the film a positive review; the average rating is 6.3/10. The site's consensus reads: "With an outrageous premise played completely straight, Black Sheep is a violent, grotesque, and very funny movie that takes B-movie lunacy to a delirious extreme." On Metacritic, it received a rating of 62/100 based on 17 reviews. In a positive review, the Houston Chronicle's Bruce Westbrook stated that the film combines its many influences with fresh ideas. Nigel Floyd of Time Out London rated the film 4/5 stars and called it a "treat for horror comedy fans". Philip French, writing for The Guardian, called it a "lively affair" and "full of what might be called shear terror". Andrew Pulver, also of The Guardian, was less impressed; he rated the film 2/5 and wrote that Shaun of the Dead had set the bar high for comedy horrors. Writing in The Zombie Movie Encyclopedia, Volume 2, academic Peter Dendle described it as an "excellent offering" that has zombie sheep "every bit as violent and contagious as the infected in 28 Days Later and other contemporary zombie fare". Golden Raven to the Brussels International Festival of Fantasy Film, in 2007. Special Jury Prize to the Gérardmer Film Festival, in 2007. Audience Prize to the Gérardmer Film Festival, in 2007. ^ "Black Sheep". Box Office Mojo. Retrieved 1 March 2015. ^ "Black Sheep". nzonscreen.com. Retrieved 5 August 2014. ^ "2006 Toronto International Film Festival – Story – Entertainment". 3 News. MediaWorks. 16 September 2006. Retrieved 20 May 2014. ^ "Black Sheep". Rotten Tomatoes. Retrieved 10 December 2018. ^ "Black Sheep". Metacritic. Retrieved 21 December 2007. ^ Westbrook, Bruce (7 August 2007). "Black Sheep". Houston Chronicle. Retrieved 9 November 2013. ^ Floyd, Nigel (8 October 2007). "Black Sheep". Time Out London. Retrieved 9 November 2013. ^ French, Philip (14 October 2007). "Black Sheep". The Guardian. Retrieved 14 July 2014. ^ Pulver, Andrew (11 October 2007). "Black Sheep". The Guardian. Retrieved 9 November 2013. ^ Dendle, Peter (2012). The Zombie Movie Encyclopedia, Volume 2: 2000–2010. McFarland & Company. pp. 35–36. ISBN 978-0-7864-6163-9.